Home > Vitamins & Food > Why Do Flour and Margarine Have Added Vitamins? Products containing flour and margarine make up a large part of many people’s diets – flour in bread and cakes, and margarine on toast, in sandwiches, and in a lot of cooked food. Flour and margarine have to have vitamins added by law – but which vitamins and why? Butter, like all dairy products, is a source of the fat-soluble vitamins A and D. Vitamin A is important for healthy skin and good sight. Vitamin D helps people absorb calcium, essential for strong teeth and bones. As well as being found in dairy products, vitamins A and D are in oily fish, and the skin in sunlight makes vitamin D. Not having enough vitamin D can cause calcium deficiencies, leading to rickets (softening of the bones). During World War II, the government rationed butter and people began to switch to margarine. To prevent this leading to a drop in the intake of vitamins A and D, the government made a law that margarine in the UK must be fortified with these fat-soluble vitamins to make the levels equivalent to those in butter. Some low fat dairy products, such as skimmed milk, also have added vitamin A and D and calcium, but it is only margarine that must have vitamins added by law. Margarine is an important source of vitamins A and D for many people. The milling process that makes white and brown flour from whole grains of wheat removes some or all of the bran and can remove other parts of the grain – white flour uses about 75% of the grain and brown flour about 85%. 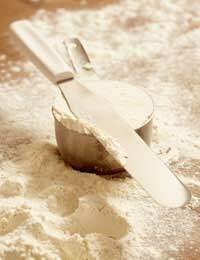 This makes the flour finer and smoother, but it also takes away the B vitamins thiamine (vitamin B1) and niacin (vitamin B3, nicotinic acid). Thiamine deficiency causes the deficiency disease beriberi and niacin deficiency causes pellagra. The process also reduces the levels of iron. Low levels of iron can lead to iron-deficiency anaemia. These have to be added back to white and brown flour by law. Because wholemeal flour is made from 100% of the grain and still contains bran, meaning that it has higher levels of nutrients, this does not have to have vitamins and minerals added by law. Because of concerns about the rationing of dairy products during World War II, which could have led to a national deficiency, the government passed a law that calcium had to be added to flour (except wholemeal flour, wheat malt flour and some types of self-raising flour that already have high levels of calcium). This law is still in place. The UK Government is looking at adding folic acid to flour in the future. If women take in enough folic acid before and during pregnancy, this reduces their risk of having a baby with a neural tube defect (NTD or spina bifida). Adding folic acid to flour is already mandatory in the USA, Canada and Chile, and these three countries have seen a drop in the number of babies born with spina bifida. Taking folic acid in pregnancy may reduce the risk of babies being born with heart defects, and increased intake in adults may also lower the risk of heart attack, stroke and some cancers in adults.